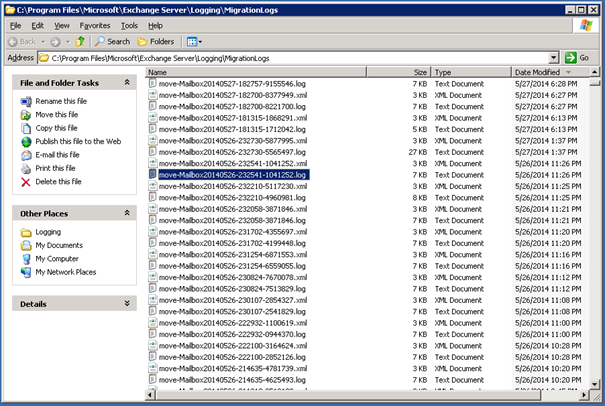 In preparation of a migration from Exchange 2007 to Exchange 2013 (interorg, so new Active Directory and new Exchange deployment) I had to clean up the Exchange 2007 environment. There was one user that had a 4.5GB Mailbox with over 50,000 items in. Moving this Mailbox from one Mailbox database to another Mailbox database (in the same Exchange 2007 environment) took a long time and after 8 hours I had to stop the move because it was running into office hours. Unfortunately this broke the Mailbox at some point and the user was confronted with the error message “Login failed because the Mailbox you tried to access is being moved”. Note. 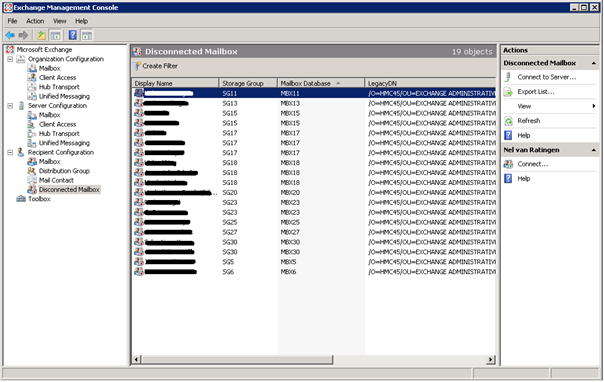 Another mailbox in the same Mailbox database was a little over 5GB in size but had ‘only’ 15,000 items in it. Moving this Mailbox to another Mailbox database took 35 minutes. [5/27/2014 6:13:18 PM]  [kathy.contoso.com] The operation has started. [5/27/2014 6:13:18 PM]  [kathy.contoso.com] Approving object. [5/27/2014 6:13:18 PM]  [kathy.contoso.com] Opening source mailbox. [5/27/2014 6:13:18 PM]  [kathy.contoso.com] Open mailbox succeeded. [5/27/2014 6:13:28 PM]  [kathy.contoso.com] Mailbox was locked successfully. [5/27/2014 6:13:28 PM]  [kathy.contoso.com] Preparing mailbox to be moved. If I disabled this Mailbox the identical Mailboxes were listed in Disconnected Mailbox, one in Mailbox database MBX12 and one in Mailbox database MBX14. You can find information on the Interwebs that this solved the issue in some cases but I was unlucky. Restart the System Attendant on the Mailbox server and dismount and mount the Mailbox database (not sure if that last step is mandatory, but it did work though) and Online Maintenance is started quickly. 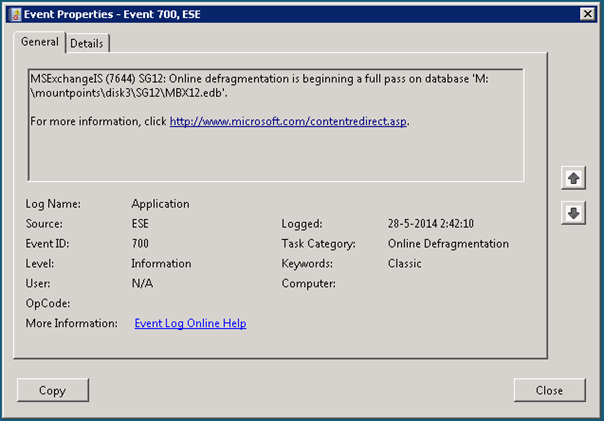 You can see this in the eventlog, check for Event ID 700 and Event ID 703. A couple of hours later I check the Disconnected Mailboxes and the user’s Mailbox was not listed anymore. At this point the user was able to login again, but the Mailbox still have to be moved to another Mailbox database. 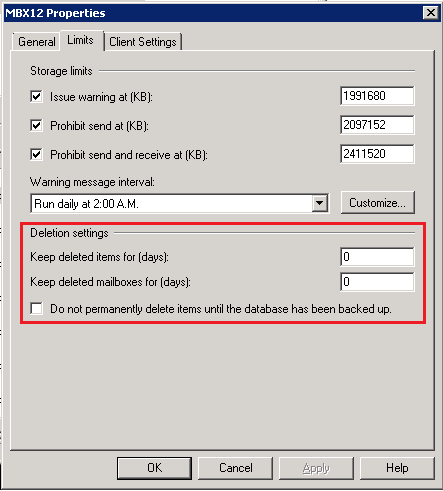 Important note: don’t forget to set the Delete Items Retention and Deleted Mailbox Rentention to their original values!